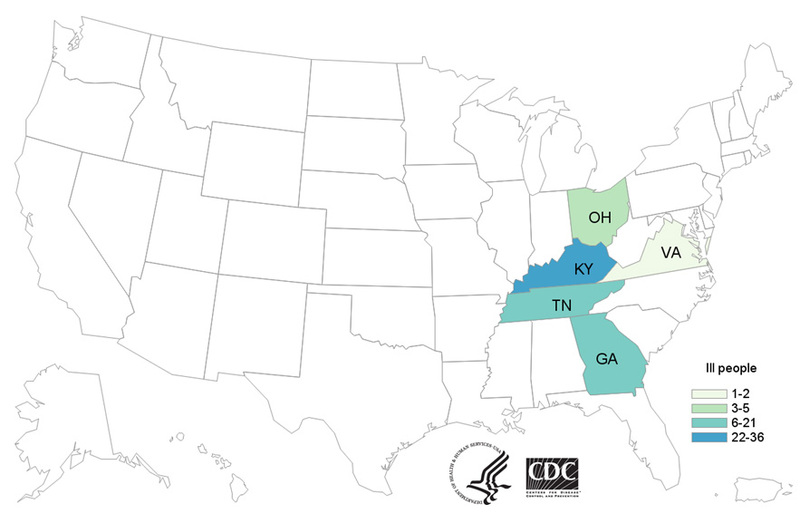 The Kentucky-centered outbreak of the rare E. coli O103 strain infects 72 people in five states, according to the federal Centers for Disease Control and Prevention (CDC) in Atlanta. Eight people with the outbreak strain have been hospitalized, the CDC report says. No cases of the hemolytic uremic syndrome (HUS) or deaths have been reported. CDC says the U.S. Department of Agriculture’s Food Safety and Inspection Service (FSIS), the U.S. Food and Drug Administration (FDA), and several states are also involved in the ongoing investigation. The probe has yet to identify a specific food item, grocery store or restaurant that is responsible for the outbreak. CDC’s report, coming shortly before noon on Friday, was the first information released by the federal agency since Kentucky officials a week earlier disclosed the outbreak occurrence. Illness from the outbreak strain occurred from March 2 to 29, 2019. People infected range in age from 1 to 74 years, with a median age of 17. CDC finds 55 percent are female. From those available to provide information, eight or 17 percent required hospital care. CDC’s case count of 72 is current as of April 4, 2019. Public health investigators are using the PulseNet system to identify illnesses that may be part of the outbreak. PulseNet is the national subtyping network of public health and food regulatory agency laboratories coordinated by CDC. DNA fingerprinting is performed on E. coli bacteria isolated from ill people by using techniques called pulsed-field gel electrophoresis (PFGE) and whole genome sequencing (WGS). CDC PulseNet manages a national database of these DNA fingerprints to identify possible outbreaks. WGS gives a more detailed DNA fingerprint than PFGE. WGS performed on E. coli from ill people in this outbreak showed that they are closely related genetically. “This means that the ill people are more likely to share a common source of the illness,” CDC concluded. Antibiotics are not recommended for patients with suspected E. coliinfections until diagnostic testing can be performed and E. coli infection is ruled out. Some studies have shown that administering antibiotics to patients with E. coli infections might increase their risk of developing HUS, and a benefit of treatment has not been clearly demonstrated.